Laos this year takes the rotating chairmanship of the Association of Southeast Asian Nations, with the group’s heads of state scheduled to hold a special meeting next month in Sunnylands, California, at the invitation of President Barack Obama as part of his foreign policy to reach out to the region as a counterweight to China. Kerry’s visit to the landlocked nation of fewer than 7 million people was meant to pave the way for the summit, with a goal of making sure Laos holds the group together. Kerry arrived in the Laotian capital Sunday. ASEAN nations such as Vietnam and the Philippines have become increasingly concerned about China’s territorial claims in the South China Sea, including its construction of man-made islands and airstrips in contested areas. But other ASEAN nations are more pro-China, including Cambodia, which blocked ASEAN from reaching consensus on the South China Sea during its 2012 chairmanship of the group. Cambodia is Kerry’s next stop on an around-the-world diplomatic marathon this week that will also take him to China. He noted that a Communist Party congress in Laos last week removed a party chief generally considered as pro-Chinese and replaced him with one who appears to be more evenhanded in his views about China and Vietnam, Laos’ other big neighbor and fellow member of ASEAN. Later this year, Obama will become the first U.S. president to visit Laos for the ASEAN summit. Laos is one of the last few communist nations in the world. The country has moved away from a hard-line communist system in the past two decades, but like its close ally Vietnam, it retains a one-party political system and its government has been criticized for being intolerant of dissent. 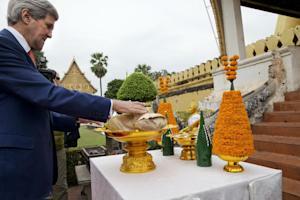 Kerry said relations with Laos are improving after a period of war and mutual suspicion. In addition to meetings with Thammavong and Thongloun Sisoulith, the deputy prime minister and foreign minister, Kerry toured That Luang, the golden-spired Buddhist structure that is Laos’ most sacred monument. Kerry also was scheduled to meet with members of Obama’s Young Southeast Asian Leaders Initiative. Kerry and Laos’ leaders discussed increased U.S. funding for a variety of projects here. That includes the removal of unexploded bombs dropped by American warplanes during the Vietnam War era, which still cause frequent casualties. Kerry, a Vietnam War veteran, also brought up a new $6 million child nutrition program, and a U.S.-funded “smart infrastructure” for the Mekong River. Phil Robertson, the deputy Asia director for Human Rights Watch, said he hopes for more human rights pressure on Laos as the country prepares to host world leaders all year. “The international community should demand Laos’ leaders end their restrictions on freedom of expression and assembly, stop their crushing censorship of the media, and permit freedom of association for workers to form independent trade unions,” Robertson said.